The event was planned and produced by the Presidents and committees of the various societies involved, in particular Sarah Carr and Nathan Jones from the Choral Society who co-ordinated rehearsal timetables and liaised with Steven Hirst to create the structure and running order of the entire performance. The script was written by Rebecca Cooper. The story had to fit around a number of pre-selected songs and dance numbers and told the very tongue-in-cheek story of a young boy who wants to become a musical sensation but is held back by his musical-hating father who urges him to take up more “manly” pursuits, such as football. After meeting up with a rather dapper guardian angel, the boy travels to the future and embraces his destiny. The play was also directed by Rebecca Cooper. It was organised to raise money and awareness for the Prince’s Foundation for Children and the Arts, for which over £400 was successfully raised. 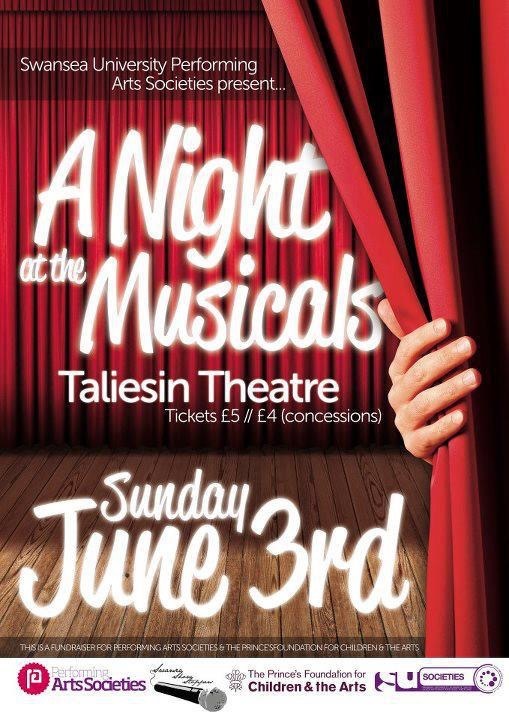 It was performed in the Taliesin Arts Centre on Sunday 3rd June.